Thursday’s best set came from Eureka Springs-based group Opal Agafia & The Sweet Nothings, performing next-to-last on the tent stage. After kicking off their stellar performance with a soft and moody “Old Ways of Living,” the band launched into high gear ­– as did the crowd – a couple songs in. The addition of a drummer (Derek Russell formerly of Dirtfoot) for this performance lent her already-outstanding alt-folk sound lots of additional power and impact and really helped everything sound tighter and more polished. The band of gifted musicians she’s been touring with occasionally rotates in a position or two, but the drums really tied it all together, and they instantly became an ensemble deserving of main stage booking. Opal’s original tracks “Hawk Above My Head” and “Yard Sale dress” are huge crowd-pleasers; the new track “Them Bones,” released on June 20, went over OK with the packed audience, but it’s still pretty new. In our opinion, Opal Agafia & The Sweet Nothings doesn’t belong in the tent after this show: Every song was a huge sing-a-long for the crowd, and her audience size matched any non-headliner that played on the main stage all weekend. That’s an impressive feat in itself. It was clear, though, that Opal and crew owned Thursday at Highberry. One of Arkansas’ newest female voices to command the attention of music fans is also one of the state’s most dynamic, unique, and stunning female voices we’ve heard in years. Opal Agafia, a native of the Russellville/Dover area, has been singing in public for a mere two years. 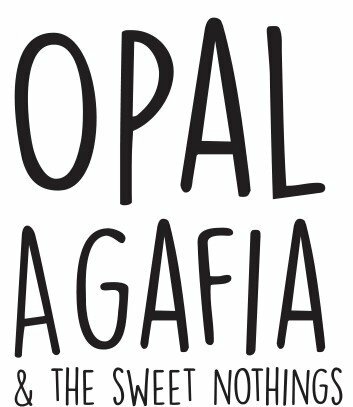 But she sounds as though she’s trained her entire 24 years for her new role as a gifted and powerful singer, prolific songwriter and capable frontman of Opal Agafia & the Sweet Nothings, based in Eureka Springs. Agafia, who grew up singing with her mom and calls herself a “lifelong serious shower singer,” is humble but ambitious. She knows she is, basically, an infant in the music industry, relatively speaking. But her performances and the 50 originals she’s already written or co-written would convince even the most experienced music fan that she’s been preparing for a music career for a long, long time. Agafia writes songs that are spunky, honest, and moving. The upbeat tracks make you wanna get up and move, celebrate your strength, or figure out how to find said strength; the slower-tempo tunes are likely to make the listener wanna love harder, live better, or laugh louder. Her voice oozes soul – she has a helluva lot of it, particularly for a white girl from the Arkansas backwoods. She also has a lot of country twang. While these attributes seem like they might not jive, Agafia combines them and many other unique qualities to create a stew of outstanding musicianship and showmanship that doesn’t simply “work” – it works wonderfully.